Well here we are then. The last summing up of an arbitrary period of days and weeks within what might loosely be described as a month in a year in arrears. So let’s kick off in traditional style then: how was your Christmas? 1. 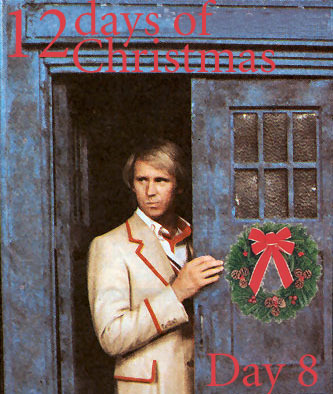 The BBC Christmas ident. Possibly the greatest moment of Time Lord Victorious. 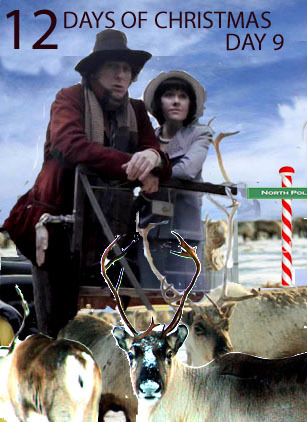 Witness the bending of time to a single man’s will as several reindeer tow the TARDIS across the sky and make a corporate logo. 2. Death in Blackpool. Yes, you heard me – Death. In. Blackpool. This is how Big Finish resolves the Lucie Miller as companion story arc and wishes its susbcribers (“Subscribers Get More… with Big Finish” – ‘more’ being followed by ‘depressed’, one assumes) a happy festive season. At least it’s summer here. 3. Hive of Horror. This is more like it! The anti-Big Finish if you will as Mad Tom, Mike Yates (ret’d) and novelty curmudgeonette Mrs Wibbsey round out Paul Magrs’ Hornets Nest story with a cracking Christmas feast in darkest Sussex. Okay, so you may wish to hear the previous installments of the story first – yes, even if very little happens in them all the while. But at least you won’t be able to say you’ve heard the likes of it before (muttermutterPlagueoftheDaleksmuttermutter). But looking back on a lean year Who-wise there was still a fair bit to please the average punters. An improving DWM (the December issue is a wee cracker, making up for the moment for the inevitable price hike), no outrageous story leaks from der press to spoil Christmas, some new stories for Old Tom Baker and some old stories for Old Colin Baker. Of course those were a bit of a mixed blessing, offering new sounds and familiar ones, but you could understand some slavering de-vo-tees being a little nonplussed with the results. Tom returning as a finer amalgam of the fictional Doc and the fictional Tom (the Little Britain/Tui beer ads one), Colin in stories from the 80s that sound and plod like… stories from the 80s. A lesson there in being careful what you wish for. Nostalgia’s a fickle beast, but on the whole we’re better for having these stories around than not, right? DEAR LORD – ABORT! ABORT! Speaking of the latter Baker years, silly us – we thought 2007 had the best curmudgeonly DWM back pages interview of them all with the triumphant party poop of a distinctly un-Joyboyish Clive Swift’s putdown, but NO! 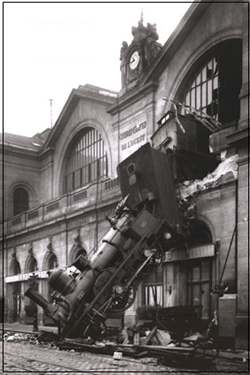 2009 saw a pretender to the throne when from out of the bushes came Nabil Shaban with some terrific moments in locomotive catastrophe. Utterly bonkers, and a little bit scary (he’s been banned from YouTube!) Confessions of “loony leftism”, pot-shots at Bush and Blair, the Beeb (they’re all in on it you see) and to crown it off “And they’ve never invited me back!”. Move over Swifty, there’s a new show in town! BUT WHAT WILL WE TELL THE CHILDREN? Yeah it is a worry, what with there not having been much on the telly of the new series and precious little of the old, whether we’re doing enough to educate the ‘new’ fans of the show that it didn’t begin in 2005 and that the series’ long and noble history isn’t anything to do with the granddaughter of Wilfred Mott. Thankfully there are a few tools of the trade out on the tubes to help us in that quest. First, and a cracking read it is, an article in The Independent by Matthew Sweet. THE Matthew Sweet, you ask? Writer of the rather splendid Magic Mousetrap for Big Finish? I like to think so. It’s not just the existence of the new series that Sweet covers, but the phenomenon of new fandom claiming the show as their own, arguably in ignorance of what groundwork was actually laid down in the last years of the old show, plus of course the not inconsiderable contribution that the show has provided the BBC in terms of viewers and ratings. For all the nudging and asides over the last five years it’s something to ponder; in the not too distant future wise heads will note that just as a long break gave Doctor Who a new energy, direction and audience, so too did the Time Lord save Auntie. If your charges over the break are lacking in attention spans and in need of a good belt of past to present series education as part of good parenting/guardianship, then look no further than Babelcolour’s Guide to the series. Stupendous! And with Farmergeddon having produced pretty much fanny allen on YouTube in recent years (but look out for his handywork inthe extas for The Twin Dilemma), we may have an heir apparent. This is it. The final end. I’ve redecorated, and it feels different this time – where there’s life the moment has been prepared for. And with that, this is the last posting for Zeus Blog. Four pretty good years – that’s longer than most New Zealand fanzines managed apart from a few venerable notables, and longer than the original Zeus Plug four times over. It’s been fun, but it’s been work too, at times, and there’s so much more I’d like to do outside of this blog and I can’t wait to get started. A huge thanks to those who stuck with the blog, encouraged me and it, and posted regularly, especially to Foo, Dave, Jono and Jamas, who provided content as well as backup, and to Alden for the space to host this rather idiosyncratic corner of the Web, and the know-how to stop it falling over, or prey to the spam wolves. That just leaves me to say “A Happy New Year to all of you at home and on holiday!” Enjoy 2010 and all ports beyond. Enjoy fandom, and share it wherever you are. This old blog of mine is wearing thin, and so with days to spare and a heavy conscience, here are a few things that slipped through the cracks this year and didn’t make publication as promised. First up, a couple of bon mots from Foo Discovers. 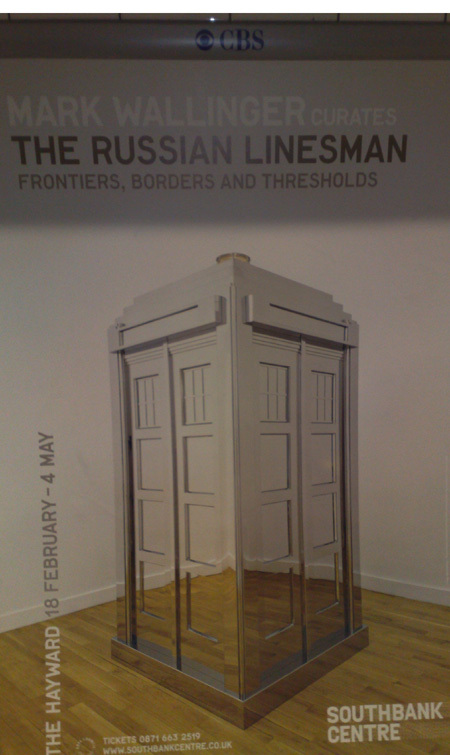 Chief among Foo’s puddings is his shot of a tube ad for Mark Wallinger’s celebrated mirror TARDIS, formally titled ‘Time and relative dimensions in space’ , late of the Venice Biennale, 2001. Good god 2001 is a long time ago! Here’s a pic from the Independent showing the work in ‘action’. Phew. 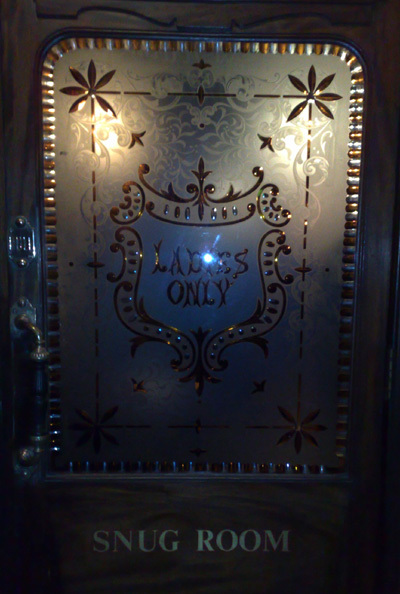 …Although something tells me membership may be a little select. Foo also proved himself a right terrier with his search for the Truth about The Doctor. Although it seems he struck a bit of a blind alley with that famous family casping aspergers his way. Still, it was a stressful time and who knows what things grief will drive people to? Ooh! And how could I forget his discovery of Vwoorped’s twisted version of DWM‘s Deathworld? Well, clearly I did forget. Criminal of me, because it’s fantastic! And on that high note, a big thanks from me to you Foo for providing the updates, the whimsy and the inside skinny on life in the UK! We’re at the end! How boxing clever of us, and we’ve days to go now to the last half of Tennant’s and Rusty’s home run, the end of The End of Time. Last question then, and for inspiration let us look to the original Doctor, the Governor, Mr William Hartnell, who created the character from so very little and gave his successors such a fantastic canvas on which to work. 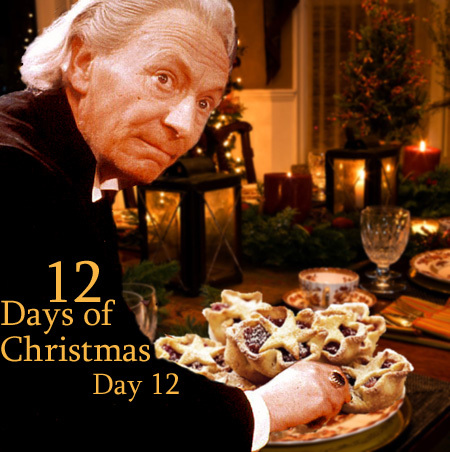 Question 12: After 46 years and especially the last five years the Doctor has changed greatly, becoming younger, more active, and more vulnerable. He increasingly wears his heart on his sleeve, and has a long personal history. In a way, it could be said that the fans of the last two Doctors could claim to know him in a more intimate way than any other incarnation. So with that in mind… Has the Doctor lost his mystery, and if so, can he ever get it back in the years to come? Who is Doctor Who now? 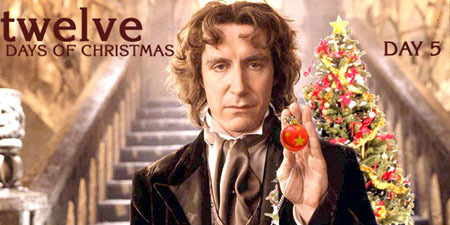 And a very merry Christmas to all of you at home! We’ve one day left after today to tease apart the last five years of Doctor Who‘s triumphant return, and the reign of two men who have ensured its success to date – David Tennant and Russell T Davies. Today of course the Tenth Doctor begins his last story proper – his song is reaching its closing bars. Question 11: Pure historicals have long ceased to be a feature of the New Series. What are your thoughts on this? Do we need historicals to ‘teach’ us history any more? And should this be a function of Doctor Who in an age of Wikipedia and Google? 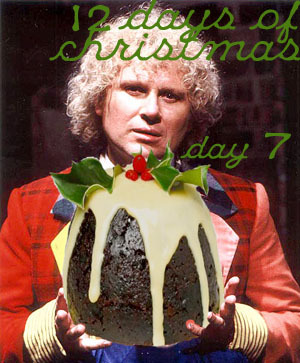 That’s some heavy Christmas pud to digest, so let’s leave it there. Happy feasting! We’re down to the third last day of our Christmas/RTD/Tennant countdown, and we have few questions remaining to cover the New Series past, present and future. So, sir – anthwer thith! 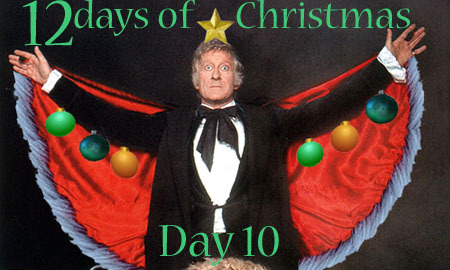 Question 10: In the spirit of Pertwee, how do you think UNIT has fared in the New Series? Would you like to see them continue to be in the show – if so, in what form? Or do you prefer Torchwood? Time for some fun! 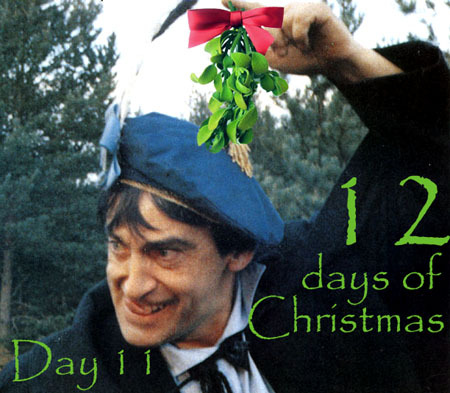 And another installment in our festive countdown to the Tenth Doctor’s imminent regeneration (sorry, SPOILER). And a question about the new series reflecting the old, and what has been and what’s to come and so on and so forth, yeeeesss. Question 9: A hawk-like nose, an old/young face, a pleasant, open face – we’ve had Doctors of old succinctly encapsulated by the likes of Terrance Dicks into such descriptions. How do you think Terrance would have described the Ninth and Tenth Doctors? 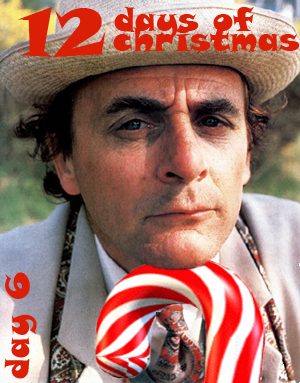 And how would you describe the Eleventh? Onward still with the questions! Question 8: Families run strong through the new series – each companion has one, and they figure largely in the Doctor’s adventures. Which family is your favourite – and is this an element that should remain in the series to come? Question 7: What’s your favourite new series monster, returning old series monster – and which monster of the past five years would you be happy to see return in the years to come? That last bit’s open of course, for anyone who’d like to put Ice Warirors in and get it out of the way! We’re halfway there – and up to date after a weekend calendar re-set! Question 6: What’s your favourite story arc of the New Series? And further: should such story arcs remain an element of the new series? That’ll do. Expect to see more ‘looking forward while looking around’ questions from tomorrow on! Question 5: What is your favourite ‘kiss to the past’ of the new series? This could be as big as the Daleks or as little as Verity and Sydney in Human Nature. Could be an interesting one, this one!